You are here: Home / Auctioneers / Florida benefit auctioneer thanked by client. I love getting emails from clients thanking my team and I for our work at a gala. And certainly we have many videos from clients and guests sharing their opinions of our work. Some clients even send cookies. 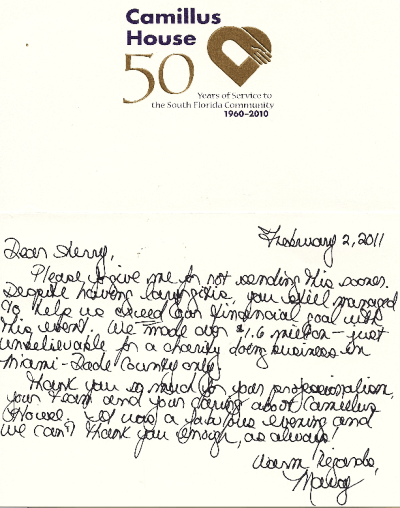 And here is an example of a personal touch through a hand-written thank you note. The Queen of Events at Camillus House in Miami, FL is the epitome of old-school manners. Like clockwork, she sends me a note or letter every year. P.S. Do you know a charity seeking a Florida benefit auctioneer? I invite you to give me a call. Though based in Washington, D.C., I am in Miami regularly.